High Bridge is a great swimming hole with a small but attractive waterfall. 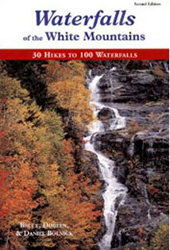 It is one of many waterfalls located on private logging land. 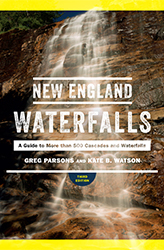 Some of the waterfalls in this area are well-known and documented (such as Gulf Hagas), but others, such as Hay Brook Falls, High Bridge, and Gauntlet Falls, are less commonly visited. 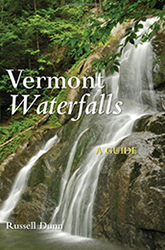 At the falls, the brook dumps into a small gorge and the swimming hole, which has historically been about six feet deep. A campsite (called High Bridge campsite #1) sits just inches from the edge of the river and is directly above the swimming hole. There are few campsites in Maine that are more desirable than this. If you'd like to camp here, but this site is taken, site #2 is just downstream and is also recommended. 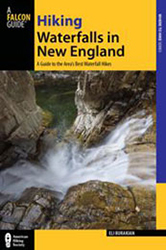 You can reserve these campsites by calling North Maine Woods, Inc. More information on camping here can be found on this website. 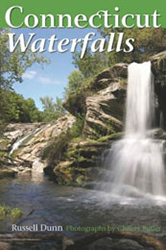 The falls are located adjacent to the well-marked High Bridge campsite #1, about 50 feet upstream of the bridge over the road you arrived on. 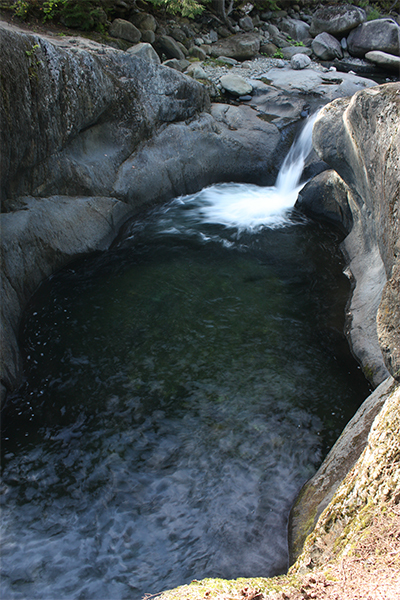 The best view of the swimming hole and falls is actually from the campsite, but please do not intrude on any campers if the site has been reserved. From the junction of ME 11 and ME 157 in the center of Millinocket, take ME 11 south. Travel on ME 11 south for 26.2 miles and take a wide right turn onto the Katahdin Iron Works Rd (which is also called the “K-I” Rd). Katahdin Iron Works Rd is a well-maintained, mostly dirt, privately-owned road that leads to the Katahdin Iron Works and ultimately connects to other logging roads that reach the town of Greenville on the shores of Moosehead Lake. If you are driving on ME 11 north from the town of Milo, Katahdin Iron Works Rd will be on the left 12.6 miles beyond the junction of ME 6, ME 16, and ME 11. Follow Katahdin Iron Works Rd west for 6.4 miles and you will reach a gate station, where you must park to register and pay a per-person day use fee ($14 for out of state residents and $9 for Maine residents in 2017; bring cash). After registering, continue driving west along the road for 0.1 mile and you will reach the first fork of this drive. Take a right, drive for 2.1 miles, and you will reach a second fork. Fork left at the second fork and continue 1.2 miles to a third fork. 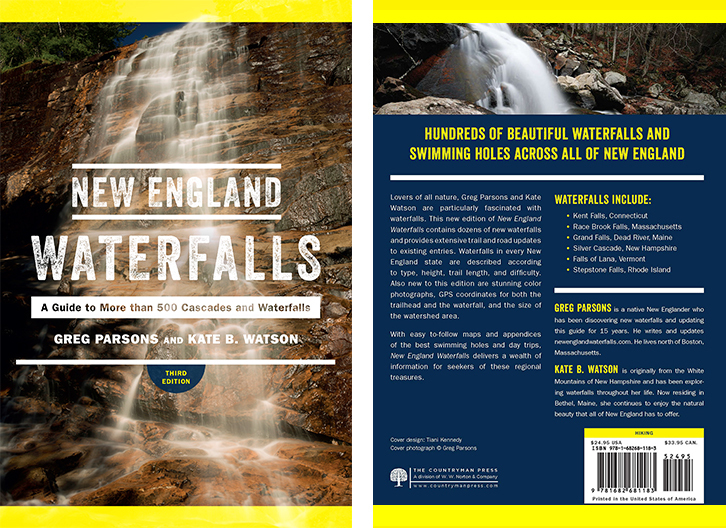 At this third fork, Katahdin Iron Works Rd continues left towards the Gulf Hagas trailhead, which provides access to many other excellent waterfalls. You'll be taking the right fork and following a series of rougher dirt roads that extremely low clearance vehicles may struggle with. From the third fork, take a right and drive 2.2 miles until you reach a fourth fork. Fork left, immediately cross a bridge over White Brook and park in a pull-off on the left in 50 feet. The falls are just upstream of the bridge, between High Bridge Campsites #1 and #3. To get to Millinocket, take exit 244 off I-95 in Medway and follow ME 157 west.